This book was a standout read in late November. A good one to read just prior to the Christmas season, to inspire me to serve who I can. 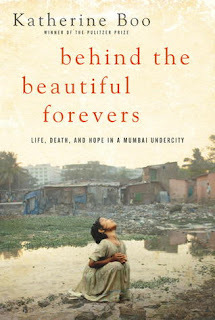 4 stars: A moving portrayal of life in the slums of India. Abdul Hussain is a Muslim teenager and resident of Annawadi, a shanty town on the edge of Mumbai's airport. He makes a living for his family sorting garbage tossed out by the rich people living in the hotels close to the airport, and recycling items for sale. He doesn't speak much but feels the weight of his responsibility to his younger siblings keenly. Unfortunately, he is on the run. You see, there was bad trouble with the Hussains' neighbor Fatima. Fatima of the one-leg, who recently died due to complications from self-immolation, and blamed it on the Hussains. They never did get along, and now her vengeance is about to tip their tenuous existence over the edge. Everyone is corrupt, everyone has a price. For the poverty-stricken Hussains, like every other citizen of their settlement, almost any price is too much. This is not just the story of Fatima and the Hussains, though they remain a common thread running through the narrative. Boo also brings to light the lives of several other people in Annawadi. It's a different world, the contrast to the lives of the wealthy made even more glaring by the expensive hotels and state-of-the-art airport on the borders of their little town. The struggle to break free from their life in Annawadi and the varied forms that may take. The deck permanently stacked against them. It was heart-wrenching. I couldn't put it down. Sometimes I get too comfortable in my American middle-class world. Books like this help bring me up short, and remind me of all the privileges I enjoy every day. It was a reminder of my responsibility to use what I have to make the world around me better. Even if I can't help the Hussains, there are those within my sphere that I can and must help. Content: There's some language, and Boo doesn't shy away from any of the situations faced by the Annwadians, from prostitution to suicide. For older teens and adults.